Burnham Wick Farm01621 782128work Touring & Camping ParkBurnham Wick Farm is a medium-sized arable farm which adjoins the River Crouch and is very close to Burnham on Crouch. 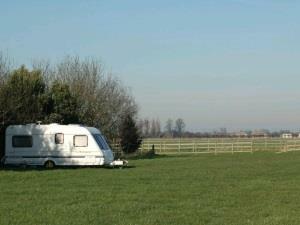 We have a very popular Caravan Club 5-van site (but we don't offer camping). Our farm has excellent footpaths and bridleways, all are good for walking, dog-walking, bird-watching and cycling. Conservation is paramount on our farm, and we have a wind turbine, a new solar farm, beetle banks and wild flower margins alongside field margins. Burnham Wick Farm is a medium-sized arable farm which adjoins the River Crouch and is very close to Burnham on Crouch. We have a very popular Caravan Club 5-van site (but we don't offer camping). Our farm has excellent footpaths and bridleways, all are good for walking, dog-walking, bird-watching and cycling. Conservation is paramount on our farm, and we have a wind turbine, a new solar farm, beetle banks and wild flower margins alongside field margins. Please note that our Caravan site is for Caravan Club members only and we can’t accept tent bookings as per Caravan Club guidelines.